Did I mention that I love tacos? 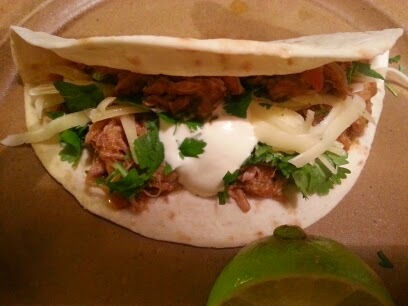 Here is another delicious taco recipe. It is a bit messy to eat because the filling is wet and tends to drip all over the place, but that is also part of the charm of eating it. This stew also tastes delicious over rice and is certainly less messy to eat that way. The recipe is based on my friend Greg's "Hot Meat" dish which he made for me when we were in college. His version was a bit simpler but no less delicious--take a jar of prepared salsa and stew the meat in it. You will notice that in my recipe, the "sauce" is essentially a salsa! This dish would also be lovely made with chicken instead of pork. Use a combination of chicken thighs and breasts for the best flavor and follow the same procedure as the pork. Serves 4 to 6 as a stew on rice, and 6 to 8 as tacos. 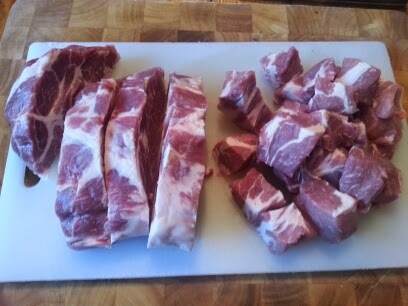 Cut the pork shoulder into chunks. The smaller pieces you cut, the shorter the cooking time. I usually do it in walnut sized pieces. Heat a large cooking pot on high heat. Add a bit of olive oil and put a single layer of pork pieces in the pot. Brown on one side and turn over and brown on the other side. 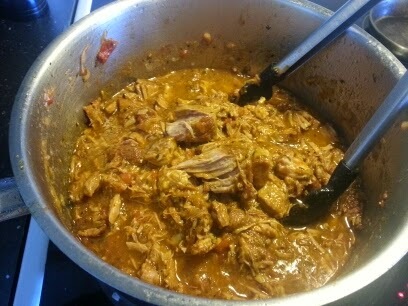 Remove the pieces into a large bowl and put another layer of pork in the pot. It will take 3 to 4 batches to get all your pieces browned. Do not be tempted to try to hurry this process and put more pork in at a time. You will just end up with a watery mess because the heat will not be enough to brown the pieces. If the brown bits at the bottom of the pan threaten to burn, in between batches, you can rinse it with a tablespoon of water and add these juices to the bowl. While the pork is cooking, peel your onions and chop roughly. I usually cut the onions into quarters and then slice them. Peel and chop your garlic. 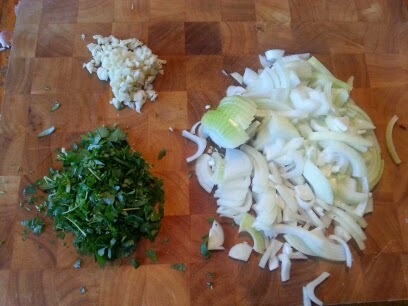 Chop the cilantro (incluidng the finer part of the stemps). Zest the lime and cut in half. When the pork is all browned, set it aside in the bowl. Add a bit more oil to the pot, if ncessary, lower the heat to medium and pour in the onions and garlic. Stir and cook for a few minutes until translucent. Add the tomatoes, cumin, salt and pepper and stir until combined. Add half of the chopped cilantro, saving the other half to stir into the meat before serving. 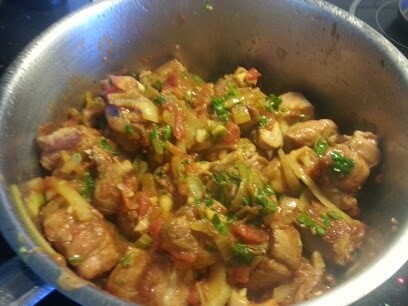 Add the pork and the juices in the bowl. Add the lime zest and juice. Stir until combined. Bring the juices to a boil and then turn the heat to very low. Do not be tempted to add water, even if the mixture looks dry because the meat will release a lot of water as it cooks. Put on the lid and let it cook for an hour. The stew after all ingredients have been added. The meat is tender but the sauce needs to be reduced. After an hour, check the stew for seasoning. As you stir it, the pork should be very tender and start to break up. If the pork needs a bit more cooking, put the lid back on and cook for a further half hour. Once the pork is sufficiently tender, take the lid off and cook for an additional half an hour or so to reduce the sauce (You can make the reduction go more quickly by increasing the heat but then you have to watch it and stir more carefully to make sure it does not burn). Right before serving, stir in the remaining chopped cilantro. Wrap the tortillas in tinfoil and warm in the oven at 350F (180C) for 10 to 15 minutes. Put the pork in a large bowl on the table. 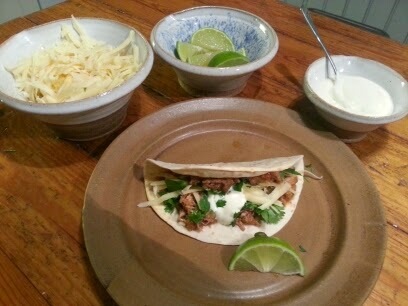 Lay the garnishes out in bowls on the table and let everyone help themselves to make their own tacos. Eat immediately with plenty of napkins. 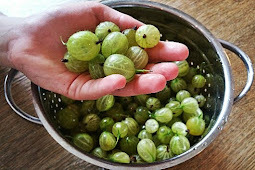 Great blog, great photos! Evil turtle oh no!! Hahahaha. Thanks Michael Kerr. Amazing what you can do with a mobile phone these days. The turtle is EVIL. You would understand if you met her.